Lot of users install other web browsers like Google Chrome, Firefox, Safari in addition to existing pre-installed Internet Explorer web browser on Windows computer. Each web browser allows you to view and manage browsing history in their own interface. Ever wanted to view Internet browsing history of all web browsers at one place? Free portable utility “Browsing History View” makes this a one click routine. 1. 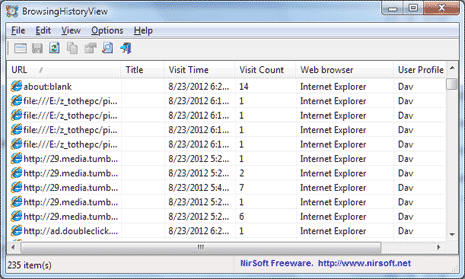 To get started, you can need to download Browsing History View utility (from reputed Nirsoft). Once you download, double click the zip file and extract its content. Then double click Browsing History View icon to launch the utility on your computer. 2. At the launch you will get advanced options dialog box. 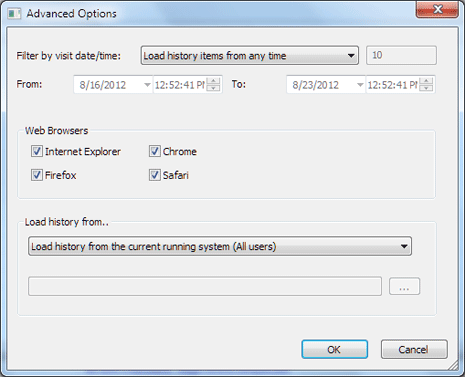 Here you can select Web Browsers from where browsing history should be displayed in the utility window. You can select either, few or all of browser options including: Google Chrome, Firefox, Safari and Internet Explorer. 3. Utility also provide various filtering options for display of browsing history. You can select to view browsing history of last few hours, days or from anytime. You can also view history from specific date / time range. It also provide option to view internet history of only the current user or all users on the computer. Browsing History View is a handy utility if you are interested in exploring web browsing history details on specific computer. There is no need to open history window of different web browsers separately which can be time consuming and effort draining process. You can do all this in a breeze using this utility which provide bird’s view of all browsing history from various web browsers on a computer at one single place.